Of all the products that I received when I was a subscriber to Cuisine Cube, the ones that took me the longest to get to were the bread mixes. I have another mix (which I hope to make in the next few weeks) for gluten-free tortillas…so…this is not an anomoly. It’s just that I already have my own gluten-free bread/dinner roll flour blend that I make amazing bread with. So, why use a mix? Besides, my bread baking skills in the gluten-free realm are…sort of hit or miss. But my March 2015 Cuisine Cube brought me a lot of amazing goodies that I have already blogged on. The only hold-out from that cube was…none other than the lunch option (weird, I know…but probably under the impression that sandwich bread would be the end result). And that lunch option was the Sevierly Good Gluten Free Organic Bread Mix. For those of you who are not familiar with Cuisine Cube, let me give you the rundown. Cuisine Cube is a subscription service that delivers 5-6 gluten-free, full-size products to your door for as little as $34.99/month. Inside the cube, you will discover full-size products (not sample sizes) that are made by local and smaller, artisan companies, rather than those that you can find at the average grocery store. It has introduced me to so many new and delightful products. Each box contains a breakfast, lunch, dinner, snack, and dessert product…and then, sometimes, an extra bonus item. Who doesn’t love a little something extra, right? Keep in mind, however, that Cuisine Cube has gone through some changes as of May. No longer do they strictly only offer gluten-free cubes. In addition to their gluten-free option, they now also offer Artisan and Vegan cubes as well. The Artisan cube means that you have no food allergies and foods that contain common food allergens will be included. The Vegan cubes contain products that are dairy and animal free. And, they still have the Gluten Free cubes, which will have products that contain no gluten or wheat. So, if you’re really interested in being introduced to the smaller, lesser-known, artisan companies, give Cuisine Cube a try! It’s like…Christmas…or your birthday…every month! Who doesn’t love that?! I did love it and I hope I’m able to resubscribe next year. So, the March 2015’s lunch option was filled by the Sevierly Good Gluten Free Organic Multigrain Bread Mix. Sevierly Good began with the Sevier family, who began their business when they realized how difficult it was to find good, local resources for the things they enjoyed eating. The company blossomed from the need for their family to eat a gluten-free diet due to high gluten intolerances. So, with a completely different diet now being served up, the Seviers decided to get into the kitchen and begin to experiment. With past experience in the baking industry and some great resources, the family created a list of recipes to begin with…and from there, a set of mixes that are versatile and easy to make emerged. For two (2) years, the Sevier Family made each mix by hand in a local, commercial kitchen. Since then, they have expanded to working with a manufacturer, enabling them to grow their dream and their product. Now, Sevierly Good Gluten Free products can be found in the more stores throughout the United States. This was actually my first introduction to any of the Sevierly Good Gluten Free products. And while I don’t always appreciate a bread mix…I do love to bake. So, I sucked it up and got together the very few ingredients needed to mix up this bread and set it to baking. Except…I decided not to make a loaf. I wanted to make hamburger buns and dinner rolls. So…I got out the rings I use to make homemade gluten free hamburger buns and got the oven preheating. All I had to do was mix together the Organic Multigrain Bread Mix with the (included) yeast packet, 2 large eggs (or egg substitute), 2 cups of warm water, and 1/4 cup olive oil. Once mixed together, if you’re baking a loaf, you pour it into an oiled loaf pan and pat/spread it into place with the spatula. For dinner rolls, drop onto an oiled cookie sheet in the desired size. I filled the hamburger bun rings…and the rest i made into 12 small dinner rolls. After they were on the baking sheet, I covered them with lightly oiled cling wrap and let it rise in a warm place for about 30-40 minutes. Then, it goes into the oven for 10 minutes at 400°F, then I turn down the temperature to 375°F and allow it to finish baking. For a loaf of bread, that’s around 40-50 more minutes. Less for the dinner rolls…but this isn’t indicated on the package. So, watch those rolls!! I got mine out before they got too baked. But, what I did notice was how golden brown they got on the top. I allowed them to cool on a rack…and then…I had to try one immediately. I admit…I was skeptical. After finally having an amazing gluten-free dinner roll recipe of my own…I don’t stray from it often. But, this product was in my pantry and calling to me to (FINALLY) bake it up. To be honest…I was impressed. This is, perhaps, the best sandwich bread that I ever baked up from a mix. They did actually rise in the rising period, which was a step ahead of most mixes. And then, they baked up to golden rolls just ready for the dining room table. I sliced one in half, finding the center to be soft (a nice contrast to the crispy outer crust) and the texture reminded me so much of what traditional bread was like. Seriously, this is a mix that a hearty bread lover will love, even if they don’t have to eat gluten free. I was so happy with each bite of the roll. So, now I have a backup for when I’m low on ingredients for my own. Completely surpassed all my expectations. So, let’s take a look at the ingredients. The Sevierly Good Gluten Free Organic Multigrain Bread Mix is made from organic brown rice flour, organic sorghum flour, organic tapioca starch, organic quinoa flour, organic evaporated cane juice, xanthan gum, yeast, and salt. It is non-GMO, certified gluten-free, nut-free, soy-free, dairy-free, bean-free and corn-free. Wholesome and wholegrain goodness in one little pouch. As for the nutrition facts, the Sevierly Good Gluten Free Organic Multigrain Bread Mix has 12 servings in a package. A serving size is 1 slice of bread. Each serving will give you 110 calories, 0.5 grams fat, 0 grams saturated fat, 0 grams trans fat, 0 mg cholesterol, 45 mg sodium, 23 grams carbohydrates, 1 gram fiber, 1 gram sugars, and 2 grams protein. One would think that with the low amounts of fiber and protein that this bread would not be filling. But I made vegan BLTs for lunch today, using one of the hamburger buns for the sandwich portion instead of bread from my freezer. I toasted the buns in the oven and then topped them with vegan mayo, baby spinach, heirloom tomato slices, and vegan (and gluten-free) bacon. This bread was…AMAZING. I loved using it for this sort of sandwich as it didn’t get soggy (even with toasting) and crumble and fall apart. It’s wonderful to have a traditional bread feel…but be able to bake it up in various ways, without having to blend all the flours myself. I, once again, have to commend Cuisine Cube for introducing me to the Sevierly Good Gluten Free brand. 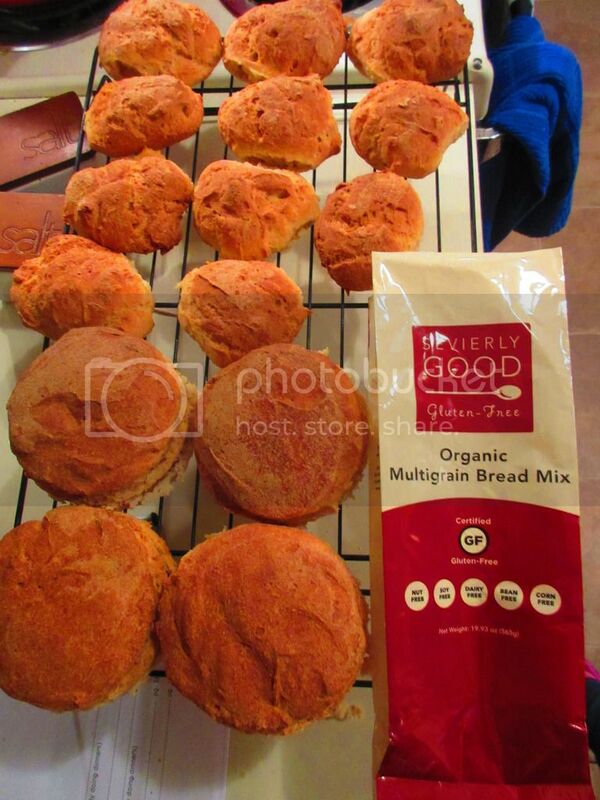 The Organic Multigrain Bread Mix was amazing…like no other bread mix I have ever baked from before. Now I sort of wish that I had done up an actual loaf, just to see how it turned out. But…that’s why I can order more. And you can too. If you can’t fiend Sevierly Good Gluten Free products in your area, head over to their Products page and have their mixes shipped directly to you. Then get into your kitchen and bake up something Sevierly Good! Orders can also be placed online from our Products page and shipped direct to your home. And, as many have said…”It’s more than good, it’s Sevierly Good”. We thank you for your business! This entry was posted in Baked Goods, Bread, Burger, Clean Eating, Cuisine Cube, Dough, Entree, Food, Gluten-Free, Mix, Products, Review, Sandwich, Snacks, Vegan, Vegetarian by The Celiathlete. Bookmark the permalink.